This is the bridge between from what Trigun fans know to what they don't know. In some ways that makes it even better than the previous omnibus. It's exciting to read about Vash's adventures in new places, but it's amazing how much the anime stood by the manga despite that. While things were changed or abbreviated for the anime I don't think any of the changes were detrimental to the story. A good case in point would be when Wolfwood journeys to Vash's "home" on a still-floating satellite. In the manga Wolfwood is given a fairly welcome reception by the inhabitants of the satellite after he deals with Gray the Ninelives in an epic duel, but in the anime Wolfwood was shunned because he was an outsider and his fight with Gray meant nothing to them. In both versions the story is pretty good, but very different. Although Gray the Ninelives was cooler in the manga and the fight he had with Wolfwood was so much more badass. I mean, how can you not love an invincible robot ran by dwarves? 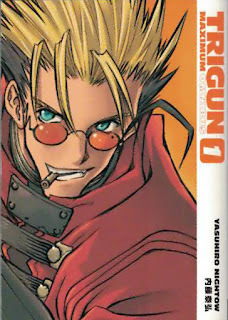 The previous Trigun Omnibus left off with Vash creating a hole in the Fifth Moon and then disappearing for two years. This omnibus picks up with Vash after his "disappearance" and we discover that he is now living life under the name of Erics and is doing his best to live peacefully. Wolfwood, for reasons that aren't quite clear, has been looking for Vash for the last two years and it would appear that he finally has found him again. Both of them know that Erics isn't real and that with Knives still alive Vash cannot truly live a peaceful life yet. So it's time for him to abandon his pseudonym and pick up his gun again. I always enjoyed that story in the anime so it's nice to finally read its manga counterpart. Vash doesn't seem to know about or remember Wolfwood's presence among the Gung-Ho Guns on the night of the Fifth Moon, but then we really don't know too much more than Vash does about this traveling man of the cloth. Why is Wolfwood affiliated with the Gung-Ho Guns at all and why is he trying to help Vash? Wolfwood is often a stranger and more interesting character than Vash himself. And that's saying something. 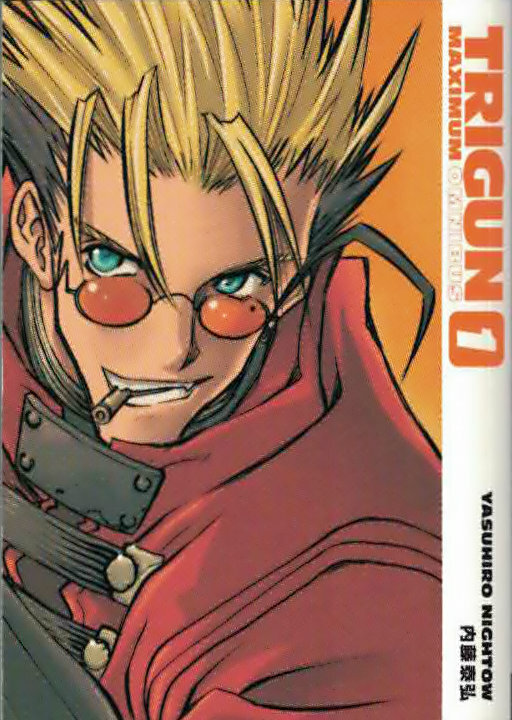 Vash believes in love and peace more than anything else and that they can conquer anything, but when he is confronted with a man that wants to avenge his daughter's murder Vash is presented with having to choose between his ideals and cold reality: Sometimes men just kill each other and that makes others want to kill, too. This point gets enforced even more when Wolfwood kills Rai-Dei the Blade after Rai-Dei falls to Vash during battle. Vash tells Rai-Dei not to kill anyone before going on his merry way, but Rai-Dei seems to be ready for a last ditch effort to take down Vash. However, Wolfwood kills him before he can try it. This in turn leads to a confrontation between Vash and Wolfwood that almost seems reminiscent of Legato's final confrontation with Vash in the anime. In the anime Legato held Vash's gun against his head and told Vash to kill him while holding Millie and Meryl hostage. In the manga Wolfwood also held Vash's gun to his head but says, "If you really believe I'm wrong, pull the trigger. In return, my role as the devil will be handed to you. That way, you won't hesitate to take out the next man that gets in your way." The similarities for that scenario really don't go much deeper. Of course, the context was different, too. It's just an interesting parallel with the anime and maybe I'm putting too much into it. Obviously Wolfwood isn't killed by Vash and the two of them continue to be traveling companions. Rai-Dei's death in the manga was so much cooler than the one in the anime, though. I'll say that much. Even though he was killed by Wolfwood both times. Vash's brief respite is over and now that he is home again and reunited with Wolfwood and the Bernardelli Insurance girls (who can be said to be the real ones that defeated Gray the Ninelives), the fun times are looking even more promising.